https://sep.yimg.com/ay/yhst-33477391359232/alveopora-coral-alveopora-species-daisy-flowerpot-coral-9.jpgAlveopora Coral - Alveopora species - Daisy Flowerpot CoralModerateSemi-aggressiveYesCalcium, Strontium, Trace elementsRed Sea, Indian Ocean, Central PacificPoritidaeSmall 2" - 3"
Very beautiful to look at, Alveopora Coral is every aquarist�s dream. Though very difficult to maintain in a captive environment, Alveopora Coral yields a tremendous look to the marine aquarium it inhabits. Actinic lighting in the aquarium does the trick and the Alveopora Coral therein looks simply gorgeous in effect. Other names: The standard scientific name of Alveopora Coral is Alveopora species while, the specific scientific names are, Alveopora allingi, Alveopora gigasi, Alveopora catalai and Alveopora fenestrate to name some. The other common names of Alveopora Coral are Alveopora Branching Flower Pot Coral, Alveopora Sunflower Coral, Yoo Stone Coral, Alveopora Daisy Coral and Alveopora Ball Coral. Coral Type:Alveopora Coral is a Large Polyp Stony (LPS) Coral. Origin or natural range: The Alveopora species is a not so commonly occurring one. Size: Alveopora Coral is quite large in size. Color: The Alveopora is found in the variations of cream, tan, brown and green colors with its oral disc and tentacle tips being white. Morphology: Alveopora Coral looks very beautiful and is quite large and delicate. The Alveopora species is colonial in nature with many polyps in each colony. The colonies of the Alveopora Coral are branched and have blunt ends with bumpy columns. Each polyp of an Alveopora Coral is tipped by twelve tentacles. The tentacles of the Alveopora species can spread to a length of hundred millimeters and the diameter of twenty millimeters. When fully open, Alveopora Coral resembles a pot of flowers and therefore the name flower pot. Whenever Ocellaris Clownfish does not get its host anemone, it takes refuge in the tentacled polyps of Alveopora Coral. The thin and perforated walls of each Corallite consist of interconnected rods and spines. Compatibility: Alveopora Coral is non-aggressive towards the other marine aquarium invertebrates. Temperature: Seventy-two to eighty-two degrees Fahrenheit. Illumination: Alveopora Coral needs moderate lighting. The use of actinic lighting is recommended for the aquarium hosting the Alveopora species. The actinic lighting highlights the coral thereby, enhancing its beauty. Water flow in the aquarium: Alveopora Coral requires medium to low water flow in the marine aquarium it inhabits. 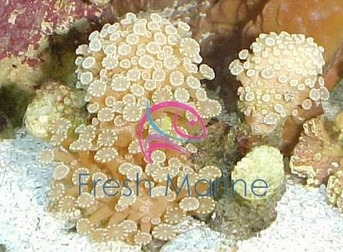 Marine aquarium habit & habitat: Place Alveopora Coral at the bottom of your tank. Give ample space to the Alveopora species so that it extends its tentacles fully. Alveopora Coral requires cloudy environment. Lagoon type, nutrients rich reef aquariums are the best suited for the Alveopora species. Feeding & Nutrition: Alveopora Coral derives its nutrition mainly through photosynthesis being performed by zooxanthellae, a photosynthetic alga living symbiotically within the Alveopora species. Alveopora Coral is, however, Planktivorous as well in its feeding habits and may occasionally filter feed on baby shrimp brine, acellualr marine invertebrates, phytoplankton and zooplankton. Add Calcium, Strontium and trace elements to the aquarium water as dietary supplements for the growth of Alveopora Coral. Alveopora Coral is very difficult to maintain and the chances of its survival in a marine aquarium is quite low. Be very particular about the Calcium level in your aquarium�s water as it is very crucial for the growth of Alveopora Coral. Keep Small Polyp Stony Corals (SPS) in separate marine aquarium than that of Alveopora Coral as Small Polyp Stony Corals require limited nutrients level in the water while, the Alveopora species requires nutrient-rich water. Alveopora Coral may sting other corals if they come in its way while spreading. Therefore, keep the other corals fairly distant from the Alveopora species in your marine aquarium.